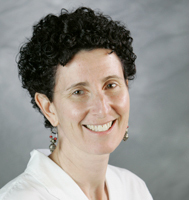 New mothers and babies who receive care at UW Health primary care medical homes have access to the nation’s first and most robust outpatient breastfeeding support program, thanks to efforts by the UW Department of Family Medicine and Community Health’s (DFMCH) Anne Eglash, MD, IBCLC. Dr. Eglash leads the UW Health Outpatient Breastfeeding Champion Program, which has successfully trained nurses in nearly every UW Health primary care clinic to provide education, support and clinical assessments for families experiencing breastfeeding challenges. The program addresses a nationally recognized need to better support breastfeeding in the outpatient setting. Although many hospitals work to promote breastfeeding—in some cases earning “Baby-Friendly”® certification—many new families struggle to sustain breastfeeding in the first weeks after coming home. “Many governmental and nongovernmental organizations have been in a quandary on best practices for supporting breastfeeding within medical systems, after moms and babies leave the hospital,” Dr. Eglash noted. She said that families needing help may be referred to a lactation consultant, but often, well-meaning medical professionals advise them to supplement with formula. That’s because most physicians and nurses don’t receive sufficient education on breastfeeding during their professional schooling. To begin to address the issue, Dr. Eglash proposed educating one nurse in every UW Health family medicine, pediatrics, and OB/GYN primary care clinic to serve as that clinic’s breastfeeding champion. In 2012, she received an UW Health Ambulatory Care Innovation Grant to develop a 16-hour training program for the champions. It includes triage tools; patient education handouts; and training on correct latching, breast pump use, and growth curve assessment. With those skills, champions can support new mothers over the phone or in the clinic during a well-baby visit. The first two groups of UW Health champions completed the curriculum in the spring of 2013 and 2015, respectively. A third group will complete it in February 2016. The champions keep their knowledge up to date through quarterly in-service sessions and access to a professional network of breastfeeding educators. And if families need more assistance than the champions can provide, Dr. Eglash and a board-certified lactation consultant are available for consultation. Dr. Eglash said that the program provides a valuable support system for new families. Lactation consultants at nearby hospitals know about it and help connect new mothers with the champion at their clinic. Initial program evaluations have shown high satisfaction among the champions. Dr. Eglash is currently surveying other providers on their impressions of the program, and is identifying ways to study how it impacts patient satisfaction measures and breastfeeding rates.